Underwriters Laboratories (UL) has an approved set of procedures for installing AEGIS shaft grounding rings inside explosion proof (XP) motors. XP motors with AEGIS rings installed according to these procedures may be used in Class I: Division 1, and Class I: Division 2 designs. Because shaft grounding devices must be installed inside explosion proof enclosures (as per IEEE 303) for Class I: Division 2, they may not be installed internally or externally in/on a non-XP motor. At this time, Marathon Electric and WEG Electric are the only electric motor manufacturer building XP motors with AEGIS shaft grounding protection installed inside. Marathon's offerings range from 3 HP (182T Frame) to 50 HP (326T Frame). For more information on Marathon Hazardous Duty™ motors with AEGIS Inside, see this brochure. For catalog numbers and pricing, see the highlighted “-P” motors on the Hazardous Duty™ pages of the 2014 catalog. In the EU, WEG Electric offers the W22Xd line of flameproof motors, which comply with the ATEX Directives. For more information, see the full brochure (note: the brochure is a 26 MB download). 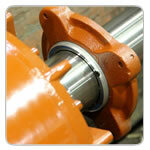 To install AEGIS rings in explosion proof motors a motor repair shop must first be UL approved to work on all XP motors. They must then apply for certification for the addition of adding shaft grounding to their UL binder and then demonstrate adherence to the additional set of procedures required for installing shaft grounding inside of XP motors. Motor repair shops with UL certification to work on XP motors and certification of their ability to add shaft grounding can "rework" any size explosion proof motor and then re-nameplate the motor as explosion proof. The drawing below was created by UL to show where the ring must be installed to comply.